The past is never fully decodable—and never was. The rebellion of 1916 was a surprise to the British authorities but it may also have been in some sense a surprise to the rebels themselves. No honest person ever knows exactly what they are doing, or what consequences will flow from their actions. In key moments of history, people are overtaken by forces of which they are but dimly aware. Did any of the men and women who seized the Post office in 1916 suspect that the independence of India might also flow from their deed? Did Hanna Sheehy Skeffington, when she went on hunger strike in a Dublin jail in a 1912 suffragist protest, realize that Mahatma Gandhi would take her act as a model decades later? This incisive observation is excerpted from an address at Babeş-Bolyai University in Cluj-Napoca, Romania on March 16th by Keough-Naughton Faculty Fellow Declan Kiberd, Donald and Marilyn Keough Professor of Irish Studies, Professor of English and Irish Language and Literature. It may suggest why the world’s preeminent scholar of modern Irish literature was recognized that day by the university with an honorary degree of Doctor Honoris Causa. 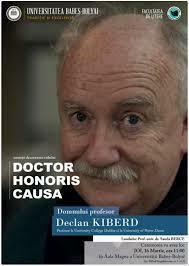 The honorary degree placed Professor Kiberd in distinguished company. 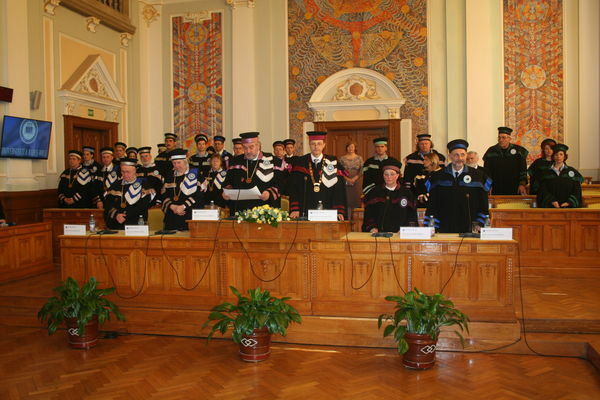 In extending the invitation, University Rector Ioan-Aurel Pop and President of the University Senate Ioan Chirilă noted that previous recipients of the Doctor Honoris Causa have been Cardinal Joseph Ratzinger (Pope Benedict XVI); Mary McAleese (former President of Ireland); Angela Merkel (Chancellor of Germany); and Mario Vargas Llosa (Peruvian author and winner of the 2010 Nobel Prize in Literature). 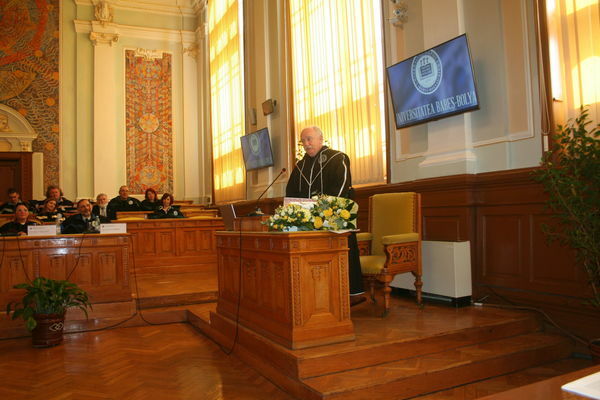 In a ceremony at the university’s impressive Aula Magna, Professor Kiberd was honored for his outstanding contributions to Irish Studies as well as his assistance 17 years ago in establishing Irish Studies at Babeş-Bolyai University. Academic events on March 16th surrounding the conferral of Professor Kiberd’s degree comprised the Keough-Naughton Institute for Irish Studies’ inaugural Keough Global Seminar, with events arranged by Dr. Rares Moldovan, head of the Department of English at Babeş-Bolyai University, and Dr. Berce. Notre Dame’s faculty delegation included two Institute faculty fellows: Mary O’Callaghan, Assistant Teaching Professor of Irish Language and Literature, who lectured on the role of the Irish language in the national education system, past and present; and Diarmuid Ó Giolláin, Professor of Irish Language and Literature and Concurrent Professor of Anthropology, who gave a lecture on the history and sources of Irish folklore. All three Notre Dame professors held sessions with students in the university’s two-year master’s program in Irish Literature and returned to campus with many ideas about future collaborations in Irish Studies between the two universities. Originally published by Mary Hendriksen at irishstudies.nd.edu on March 31, 2017.